The Columbia University Archives collects, preserves, and provides access to records of enduring historical, legal, fiscal, and/or administrative value to Columbia University from the 18th century to the present. 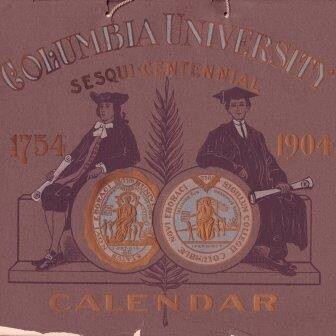 The University Archives, established in 1991, has its roots in the Columbiana Collection, a vast store of Columbia memorabilia including documents, records, artifacts, photographs, and books which was created in the late 19th century and endowed as a department in 1930. Areas of documentation include contributions to teaching and research; the development of schools, academic departments, institutes, and administrative units; the development of the physical plant; campus and student life; public service; and the University’s role in the history of the metropolitan, national, and international communities. Prominent University Archives collections include Office of the President Central Files, Office of the Provost Records, the Historical Photograph Collection, and the University Protest and Activism Collection. Records are collected regardless of format (paper, electronic, visual, objects) and include correspondence, university and student publications, photographs, negatives, minutes, reports, ephemera, audio-visual media, artifacts, theses, syllabi and other course materials, scripts, maps, posters, drawings, as well as born digital and electronic records. With the exception of periodic web site harvesting, the Archives will not collect records which are still in active use. Records of individual students as well as records of other organizations and individuals which contribute uniquely to the understanding of the University’s history will be considered on a case by case basis for inclusion in the collection. Published works directly relating to the institution or about significant Columbia personalities will also be considered for the collection. Records relating to Architecture, Barnard College, Health Sciences, School of Law, and Teachers College should first be offered to those respective archival repositories before the University Archives will consider accepting them. While the University Archives purview emphasizes Columbia’s institutional records, the University Archivist will assess offers of faculty papers in consultation with the Rare Books & Manuscript Library (RBML) curators. We encourage senior faculty (especially University Professors and those with emeritus status) as well as high level administrators to consider donating their papers to the RBML. The criteria for selection include: outstanding contributions in and beyond his or her field, faculty whose area of research overlaps with RBML’s existing collecting strengths, and those which help to document the institutional history of Columbia University. In every case we look for materials that do not duplicate, but rather substantially enhance what can be found in the published record, for example correspondence, files relating to university committee work, and some research files.